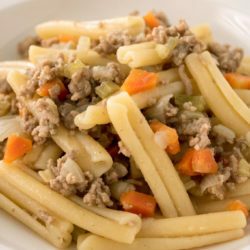 One of the most famous classics of Italian cuisine is the Bolognese SauceWhat in Germany misdiagnosed as “Spaghetti bolognese” is known. 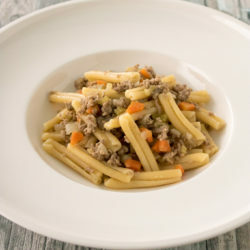 The meat sauce is very popular, but is not prepared to fix as a good tomato sauce with increasing cooking time taste better. A quick recipe for this sauce can I not tell you of this, but there are a tasty, not so well-known variant of this pasta sauce: white sauce. 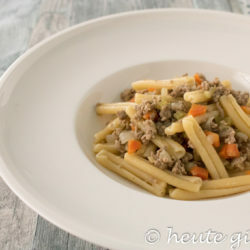 The “white ragù” hat seinen Namen von der fehlenden Tomatensoße. 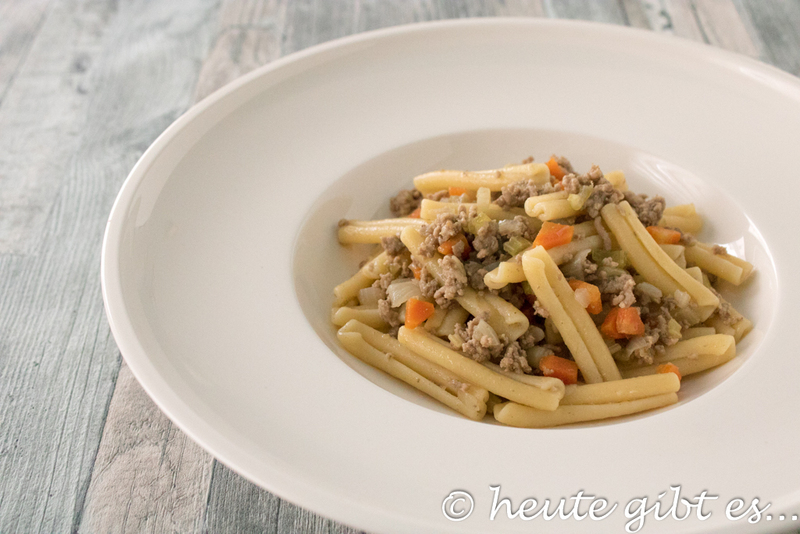 Genau wie beim Klassiker bereitet man zunächst einen Soffritto, eine Mischung aus angebratenen, gewürfelten Zwiebeln, Staudensellerie und Karotten, vor. Dazu kommt noch Hackfleisch, was bei diesem Gericht aber gerne aus verschiedenen Fleischsorten bestehen darf. Als Flüssigkeit wird Fleisch- oder Gemüsebrühe hinzugegeben. Falls ihr euch Sorgen macht, dass das Ergebnis zu trocken ist, so sind diese unberechtigt. 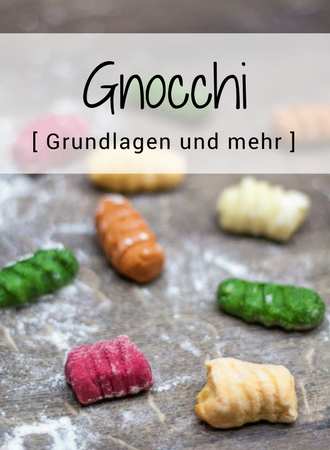 Am Ende erhaltet ihr ein geschmacksintensives Pastagericht, das genau die richtige Menge an Soße hat. The great advantage of this court against the classic is clearly the time. I do not need can be served several hours until it. It is a delicious alternative and especially in people the tomatoes not possibly tolerate the ideal solution. Clean the vegetables, peel and cut into cubes. In a large skillet, heat the oil, add the diced vegetables and fry for about 5 minutes over medium heat. Now add the minced meat and also stir-fry until it is evenly browned. The herbs then add, deglaze everything with the wine and continue to cook over high flame. Once the alcohol has evaporated completely, Pour in the broth and simmer over medium heat for about 10 minutes until no more liquid in the pan is. 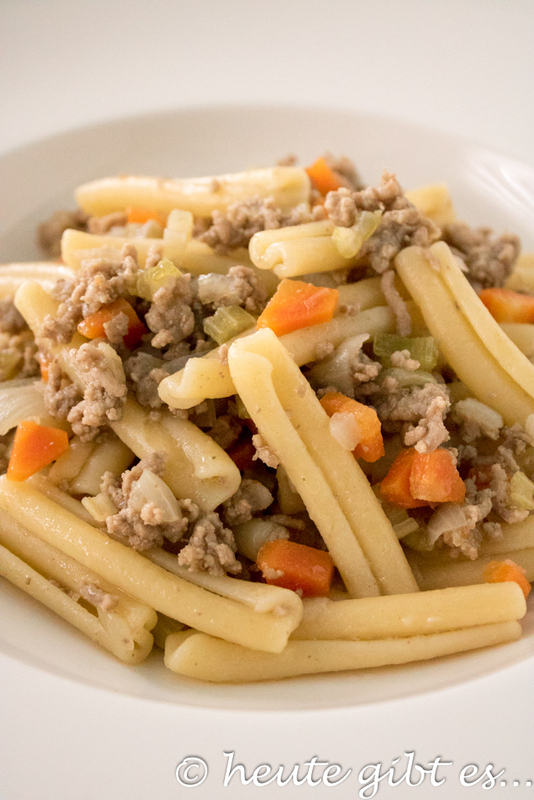 cook a pasta places of your choice in salted water until al dente in the meantime. Season the finished sauce with salt and pepper, turn off the oven and remove the herbs. Finally, the chewy noodles add to the pan, mix everything well and serve. The meat can be made of meat of your choice. 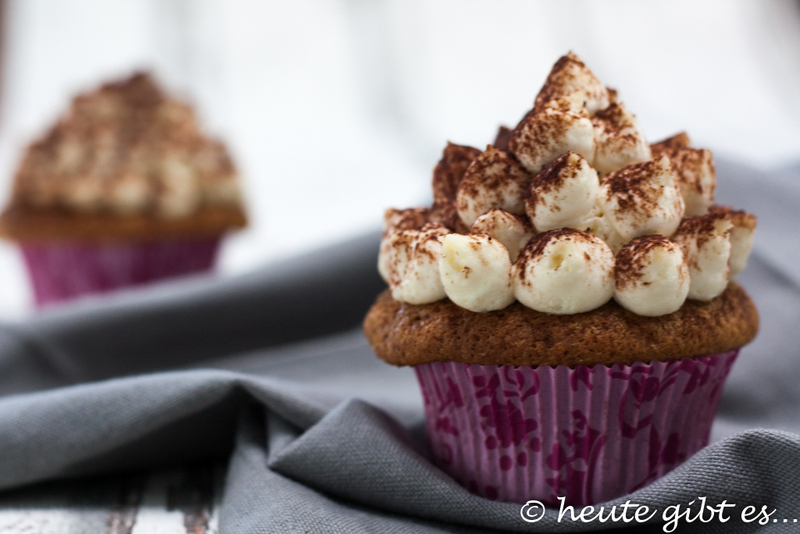 Try different variations of a different flavor. So that the herbs can be easily removed, they can also be tied together or filled into a filter bag. 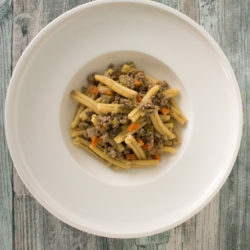 For this dish is short pasta are particularly suitable. How do you like this version of the classic? 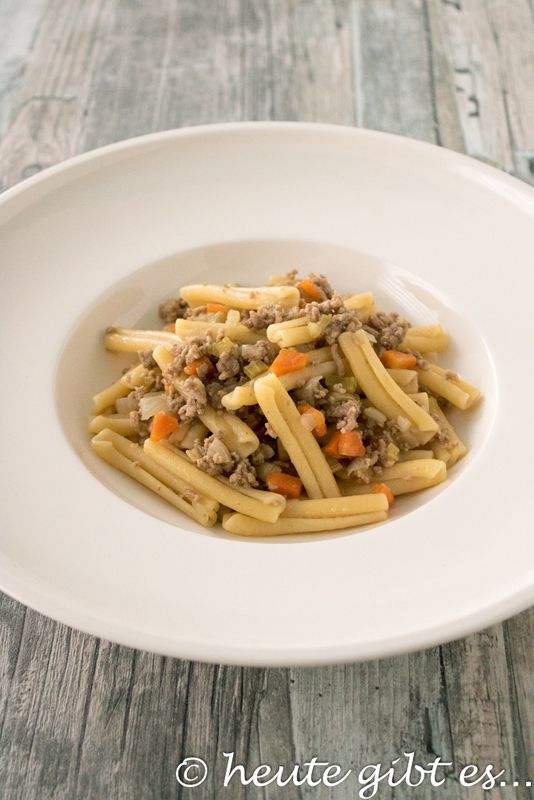 Although her here not needed as long as the original bolognese sauce, but you will still need about 45 minutes. If you are looking for a very quick pasta dish, I recommend Spaghetti alla carbonara, Pasta with creamy gorgonzola sauce or Pasta with a light lemon sauce. 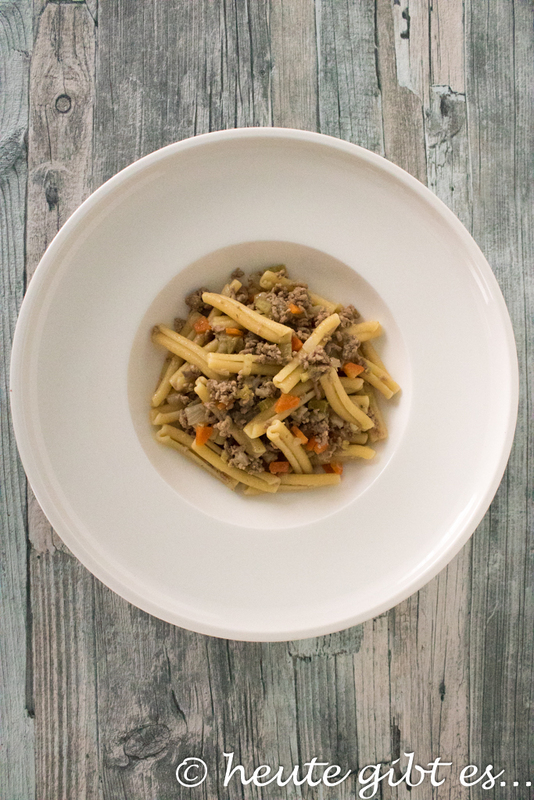 5 Kommentare zu "Pasta al ragù bianco – a tasty version of the Italian classic"
This looks so delicious! Coming right up into my collection of recipes ❤️ Thank you for that!